If you know about the repro cart business, and indie developers who publish their own original games (or Mario/Zelda hacks) on cartridges that can be used with a real NES….you’ve most likely wondered how it’s done. Publishing a game on a cartridge that requires a chipset and circuit board, as opposed to sending out a digital file or burning a disc, sounds incredibly complicated. And it is. Andrew Reitano, an electrical engineer from New York, makes physical versions of the NES game he created, “Super Russian Roulette.” The good news is that he’s invented a universal circuit board that the NES can read any game from (original carts needed a custom board for each title). That eliminates some of the work, but not all. Reitano told the website Polygon what he needs to finish the job. “The typical process for me is to design and order a prototype printed circuit board domestically, prove out the circuit, then order a large quantity of blank PCBs overseas. The PCBs for the NES are an uncommon thickness and I pay a little extra for electroless nickel immersion gold (ENIG) to prevent corrosion on the edge connector.” He then orders integrated circuits and capacitors from online distributors, then wires and solders it all together by hand. 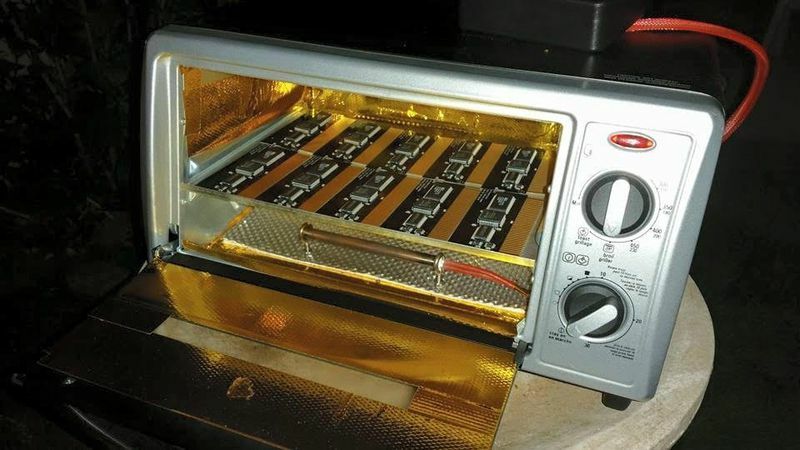 Finally, the finished circuit board is actually baked in a toaster oven to set the solder work. As for Super Russian Roulette, it is a game where two players hold NES Zappers to their foreheads, and the first one to pull the trigger on a bullet loses a point. This use of Nintendo’s light gun never would have been approved back in the day, but according to Reitano, that’s part of the appeal that’s selling copies.